One of the most interesting aspects of the recent visit to India by a Parliamentary delegation was the opportunity it gave us to learn more about the Indian upper house and the way it functions. We were taken in to a meeting of the Rajya Sabha as it is called, and did not have to endure any protests, as had happened in the Lok Sabha – though I should note here that, while media attention was concentrated on the ten or so members who shouted at us, the 500 and more who cheered us were ignored, friendship obviously not being as notable in media parlance as hostility. And we should also register the authoritative but dignified way in which the Lady Speaker handled the situation, shooting down singlehanded it seemed the vociferous shouts of the unruly members. There was a different scene in the Rajya Sabha, when one member insisted on making a protest and then walking out. I was told later that this was a member of the DMK, and he could not allow his party to be outdone, since the protest in the morning had been led by Jayalalitha’s AIDMK. The Chair of the upper house, who is also Vice-President of India, an extremely dignified Muslim gentleman, was not equal to shouting down his recalcitrant member, but that would not have been appropriate perhaps in that house. His apology however was equally sincere, and the rest of his membership, including a very articlulate member from Tamilnadu, more than made up for the embarrassment. But that is the very nature of an upper house, a forum for quiet and collegiate discussion, where different approaches can be reconciled without recourse to the dramatization that is the essence of lower house debates all over the world. I have already mentioned the need to improve our committee system in Parliament, so as to develop opportunities for informed discussion and the building of consensus. 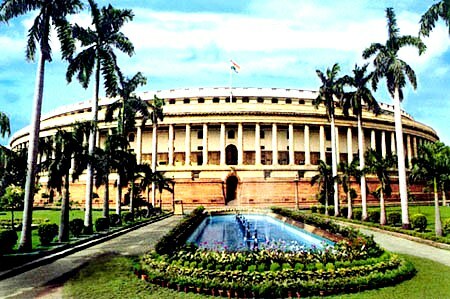 But whereas that is part of the inner workings of a lower house, it is the very essence of an upper house which, while necessarily subordinate in legislative and other parliamentary powers to its twin, usually has a larger role to play with regard to fine-tuning legislation and ensuring responsiveness to non-political concerns. The Rajya Sabha, like almost all upper houses except for our ill-starred own Senate, is based on regional representation, with greater weight proportionately for smaller units. Election to the Senate is by regional assemblies, which of course allows for distinguished individuals whose services are required to be brought in by regions where the party that wants them has the required numbers. Thus the current Prime Minister, as well as several Ministers – including the highly distinguished Minister for Human Resources Development – are members of the upper house, though they are entitled and expected to appear in the lower house to ensure accountability. All those on our delegation I spoke to about this agreed that we too should have an upper house. This has been mentioned in the President’s manifesto. However nothing has been done about this, I suspect because those in Parliament now still think in terms of the useless Senate we once had, and have no commitment to the idea. This is sad, because it is the type of reform that would make clear our commitment to moving forward towards a more comprehensive system of representation. Indeed about a year ago a diplomat from a country which is I think essentially sympathetic to Sri Lanka said to me sadly that we would do much better – and also help those who wanted to help us – if we moved on things like the Senate, which was not something anyone would oppose. I am not I think revealing any secrets when I note that this generally positive approach was a feature also of the talks with the TNA, once the proposal had been placed on the table. I believe one participant made the point publicly that a Senate could not be a substitute for other reforms, and I can appreciate that view. However the recognition that this could only be a positive feature in itself, by enhancing the participation of the periphery at decision making at the Centre – and it is certainly acknowledged by all now, unlike in the ghastly days of the LTTE, that the Centre will have a large role to play in a great many areas, whatever is decided about matters under discussion such as the Concurrent List – was heartening, and I continue astonished that we do not go ahead and implement whatever is not controversial, instead of waiting to find an ideal solution for everything. After all, a basic principle of problem solving – which is sadly not taught in our education system – is that when one solves the different small elements in a puzzle, the larger problem will become easier to resolve. This perception, and the ability to think outside the box, is not however a feature of political discourse at present. Another reason it would make sense to think more seriously about the Senate, apart from the fact that it would be in accordance with the expressed vision of the President, is that it might help with another difficulty that has cropped up, namely the different in representation that Jaffna will see after the next delimitation. While I am sympathetic with the disappointment of the TNA at this, the population figures speak for themselves, and it would not be correct to go on with numbers that do not reflect the actual balance of population, given that the essence of a lower house is representation based on population sizes. However, if a Senate were begun on the basis of equal representation of all provinces, with say 5 members for each Province, rather than the 2 or 3 originally envisaged, we would be able to ensure the involvement of more distinguished members from the North in parliamentary deliberations. I cannot see anyone objecting to the establishment of an upper house, except perhaps on the grounds that it would involve additional expense. But I believe we can easily reduce the number of members in the lower house – so that Jaffna alone will not suffer – which in any case is desirable if we are to move to a mixed system of elections as envisaged. And, at the risk of making myself redundant, the National List will no longer be necessary once a Second Chamber is in place that could provide space for the more desirable elements now in Parliament through the National List. But again, despite all these positive arguments, I suspect nothing will be done. Lethargy, based on the spurious argument that comprehensive solutions are necessary or nothing at all, will triumph, and in years to come, long after we are all gone, we will have a single chamber Parliament with the same electoral system as now.